Soccer conditioning drills are often overlooked. No soccer team "likes" doing fitness exercises but it is an important aspect not to be overlooked at the appropriate ages. What ages should I start doing fitness? A few minutes for pre-teens is fine to get them into the habit, but ideally I would start with teenage teams, 13 and up. Younger players are typically so active and should be more focused on having a ball at their feet as much as possible. Why is conditioning soccer players important? 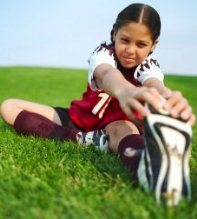 As players get older in the youth soccer leagues, fitness is increasingly important to be highly competitive. It can be done as easily as just using a handful of minutes at the end of training, or some coaches will prefer to incorporate their soccer teams fitness into certain passing exercises. Below are a handful of soccer fitness drills that I didn't always enjoy doing... but know they definitely helped my soccer team conditioning levels improve.